clay and limestone: It Was A Dark & Scary Walk! It Was A Dark & Scary Walk! A gnarly dead tree and shadowed woodland paths. Wasn't that last year's dark and spooky garden post? the wayback backyard REALLY was scary? If you don't recall go here to see it! Today, it's all dressed up in fall colors. hidey hole for the dear deer that found the gate open! It was a dark and scary walk, but not anymore. The Dancing Tree kicking up her heels in celebration. Here are a few really scary things going on at C&L! Vampire mosquitoes still biting when it's 50 degrees! 20+ inches of rain that's be-witched hamamelis 'Diane' to mildew! New invasives taking root overnight! Were they dropped off by alien space ships? Close your eyes if you don't want to see anything too scary! has spilled over into bedlam! Take a look at my mosaic shed! There are surely cobwebs in the corners! This scary looking Pterodactyl Seedpod has taken up residence in the garden! But, it's not completely horror filled! for a few minutes and fall has arrived in Middle Tennessee! I sure hope your holiday has just the right amount of spookiness! You are lucky your shed only has cobwebs. Mine has camel crickets by the thousands and spiders to go along with those webs. ewww Oh, and that space by your computer looks perfectly normal to me. Thanks for the email with the link, will be checking out lots of plants today! Happy and spooky Halloween to you Gail! I especially love the seedpod. Whoa, loved the beautiful foliage color, Gail! (And yes, that B&W shot of the lawn chair really *was* kinda creepy... ) If you think that mildly toppled pile by your computer looks bad, you should see the piles all over our home office floor while we're writing two books. Yikes!!! As for cobwebs, you just need to adopt the attitude the irrepressible Maxine displayed on my favorite Hallowe'en card this year. She looks around at her spooky, cobwebbed Hallowe'en display and announces that she didn't really decorate for Hallowe'en this year, she just stopped cleaning the house! A very happy Hallowe'en to you and yours! You are not the only gardener/crafter with piles and piles of stuff sitting around..Now, I feel much better. 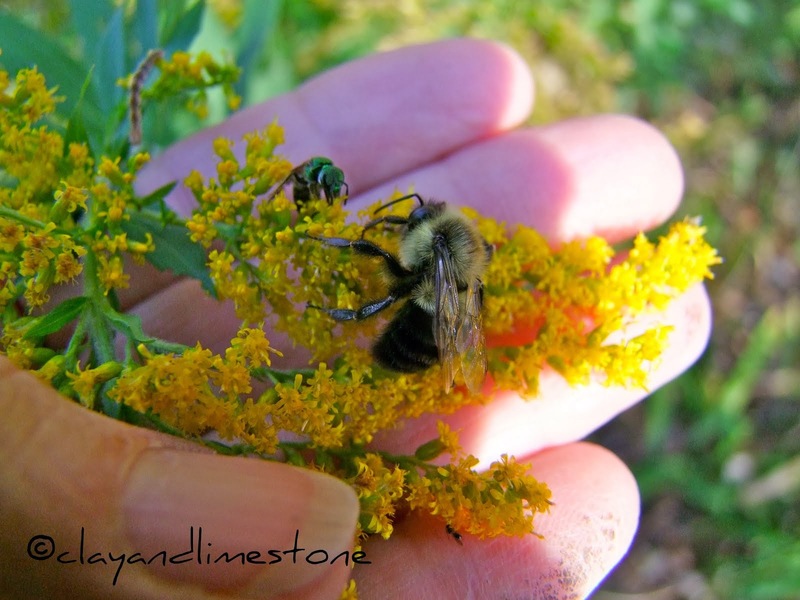 Your garden sure has come a long way, just beautiful! I love your mosaic shed! I really admire you for sharing, I couldn't bear to show my workspace without cleaning! I can tell a lot of creativity is happening in there. I love the little windows, looks like a lovely studio! It's funny how spooky regular things look poping out of the fog. I ran into a couples of cow, almost literally, on a foggy night. It scared all of us, me, the dog, and the cows. LOL! Happy Halloween!! I had to go take a nerve pill. Probably won't be the same all day. You'll have to think of posting something more calming in the near future. I do remember last year's haunted trees too. All those scary images. "Think happy thoughts, think happy thoughts!" This is the time of year when every shadow is mysterious, and cobwebs, spiders, and all kinds of scary critters get a little braver about showing themselves. Dark and scary night indeed! It feels like that now with all this wind right now. Hi Gail, Wow! You have more unread material than I do! 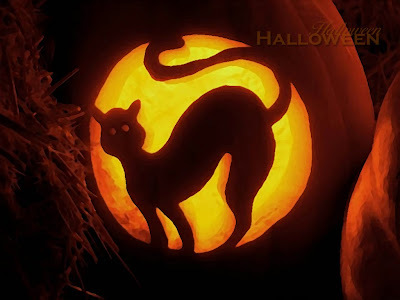 Love the cat pumpkin, too. Yay, fall! If you think your pile of reading material is scary, you should see my laundry! Happy Halloween! Pterodactyl seedpod indeed! I just love what we see in our gardens. Happy Halloween, Gail. Awesome pumpkin! For a minute there I thought I was suffering from deja vu. I'm having a hard time restraining myself from complaining about all the rain, but after the last drought, I promised myself I never would. At least things look good from a distance at Clay & Limestone. Happy Halloween! Gail....am I the only one sitting on the edge of their seat, terrified in case something scary takes place. I am having a halloween party for the grandchildren....I have my costume and wig waiting (there will not be any photos!!). Happy Halloween! When Mark says the piles next to the computer are getting dangerous, I know it's time to clean up. Compared to mine, yours look under control. Love that final pumpkin image! As little Loudon would say--I no like mosquitoes! But we DO like the Pterodactyl Seedpod. And I LOVE all your Autumnal color. I am jealous of your mosaic shed--I don't even have a potting or tool shed! I bet you do lots of lovely work in that space. You were very brave to show the pile of books near your computer area. Although I have you beat by several piles, I wouldn't have the nerve to expose my messy reading obsession (I need to have a garage sale)! What a fun post to read today. Thanks for the before and after pics, too! Very creative writing, indeed! The area round your computer looks most comforting - not at all scary :) A happy and spooky Halloween to you Gail. Cute post for the scary weekend. I'll show you the meaning of the word bedlam... and not just beside the computer. One look, and you'll feel infinitely more organized. All part of the service. I love reading this post. 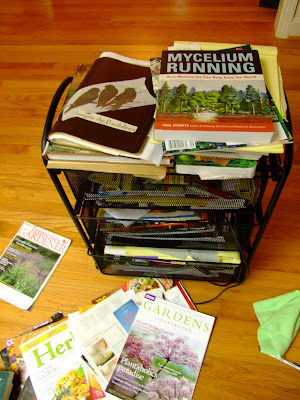 Glad to see I'm not the only one with piles and stacks around my desk and kitchen, maybe it's a gardener thing. Lots of great scary pictures, especially the one of the chair under the tree. Mania, The tree was struck by lightening and we left it for the woodpeckers and other birds. A hawk loves to hang out there in the winter. A fun, scary post Gail! It's looking mighty colorful there - enjoy! I'm working on the Lawn Man to leave nice dying juniper in our wayback for the wildlife. Wish me luck! 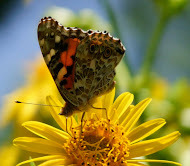 You have so much colour in your garden now it is beautiful .. so secluded .. yes .. I know you are mixed in with civilization but wow .. this is a garden I could love no doubt about it .. and it can take a Halloween type of mood easily too .. perfect ! I hope you have that black and white of the chair framed and hanging on a wall somewhere. Happy Halloween, Gail. That pumpkin is fantastic. I can't believe it's 12 months since your dark and scary walk. What a wonderful post! Totally perfect for Halloween. Your fall color looks beautiful - I'm enjoying every minute of ours. I liked that post too! The wayback backyard looks wonderful now. The spce around my computer tends to collect a lot of books too, even though there's a bookcase right there. Oh, you have a MOSAIC shed! It's not scary at all, it's lovely, even with cobwebs. Happy Halloween to you, too, Gail. I enjoyed your Halloween post. Love the trees and all their colours. Love your Mosaic shed great place to potter away.